Now your group can offer classes in Basic Gardening, taught by some of the most experienced Urban Farmers in Milwaukee! Gretchen Mead of the Victory Garden Initiative has teamed up with Janice Christensen of the Community Garden in Kilbourn Park to create a best-practices basic gardening course. Four basic 90-minute gardening classes will take beginning gardeners through the steps of garden design, planning, planting, fertilizing and troubleshooting, getting them ready for a great summer of vegetable gardens from idea to delicious harvest! This is your chance to step into the world of backyard or community gardening with the confidence that a solid grounding in basic skills can bring. Four classes are offered in the Basic Gardening program. Learn where will your garden grow best? Learn about sun and shade, which crops to grow where and how to plan for a mix of beds, containers, and even vertical garden spaces! Plan your garden around your menus. How about a salsa garden? A ratatouille garden? Even a pizza garden! Or simply plan a basic vegetable garden for optimum production in your area’s microclimates. Learn about making a garden map and planning for crop rotation in the coming years. Lettuce grows fast. 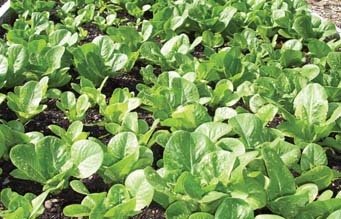 Did you know you can replant lettuce as you harvest, and grow as many as four crops in one summer in the same space? Companion planting will teach you why broccoli loves rosemary but doesn’t like tomatoes, so you can plan a vegetable neighborhood where everyone gets along. Soil fertility is the key to successful gardening. This class will teach some basic soil fertility tips, how to start, how to keep your soil healthy, how to listen and understand if your plants tell you they need some different kinds of food. Easy, organic methods of soil improvement and plant nutrition will make your harvest the envy of your neighbors! Now is the time to get your group together and sign up for the Basic Gardening Series with Gretchen and Jan presented by the Victory Garden Initiative in conjunction with the Urban Ecology Center. Don’t miss this chance to get started with a great garden, right in your back yard!